The demand curve for money is called the liquidity preference, for a good reason. This curve drawn in the real interest rate/real quantity of money space shows how much money you want to keep in your pocket or in a non-interest-earning account, such as your debit account. Of course, a good reason to keep money with you (or on your debit account) is the relevance of money as the medium of exchange. 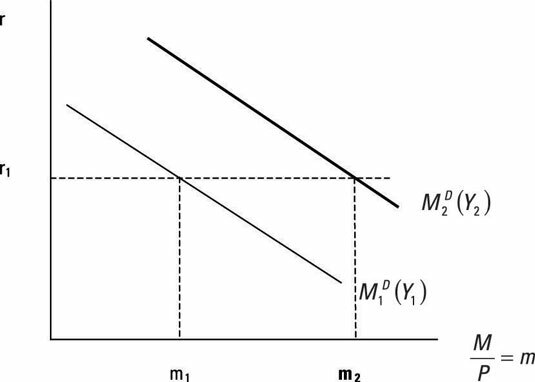 The figure indicates the x-axis as the real quantity of money, where the nominal quantity of money (M) is divided by the average price level (P). For example, if you have $100 and tall lattes of $2 each are the only good you consume, your real money, or the purchasing power of your nominal money, equals 50 lattes ($100 / $2). The y-axis refers to the real interest rate (the nominal interest rate minus the inflation rate). You see that the money demand curve is a downward-sloping curve in the real interest rate-real money space. When the real interest rate increases (moving from Point 1 to Point 2), the quantity of real money demanded declines. In other words, people carry less money to take advantage of higher real interest rates. Similarly, when the real interest rate is lower (moving from Point 2 to Point 1), the quantity of real money demanded is higher because people are losing a smaller amount of interest income by keeping more money. Drawing the money demand curve in the real interest rate-real quantity of money space is one of the alternative explanations of the money demand, which is commonly used in the Monetary Approach to Balance of Payment (MBOP). The money demand can also be derived in the nominal interest rate-nominal quantity of money space. In other words, the assumption is that the values of certain variables are assumed to be constant along the money demand curve, no matter where you are on the curve, Point 1 or Point 2. In the case of the money demand curve, one ceteris paribus condition is worth mentioning: real income, which can be measured as real GDP or real income or output of a country (Y). 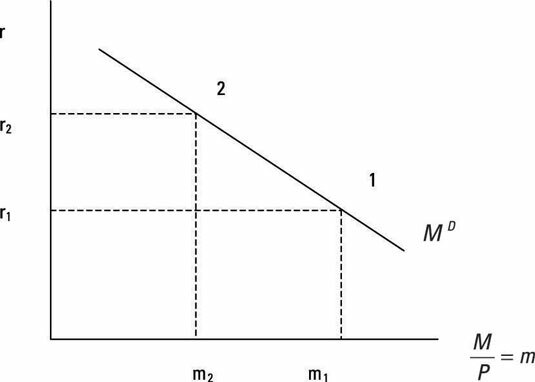 The following figure provides an example for a shift in the money demand curve. The shock associated with this shift is an increase in output. As output or real income increases, at the given real interest rate, the quantity of real money demanded increases as well. Because the value of the X variable increases at the given level of the Y variable, you refer to this shift as an increase in the money demand curve. Similarly, if a decline in the output of a country takes place, you decrease the money demand curve, which leads to a lower real quantity of money demanded at the given real interest rate.